The authoritative document that describes the structure and legal obligations of the NS-3 Consortium is the NS-3 Consortium Establishment Agreement that has been signed by the University of Washington and the INRIA. Some corrections to this document were made in the following amendment. The following text provides a high-level overview of the way the NS-3 Consortium works. The Steering Committee is initially composed of six directors, including one rotating Executive Director serving for a term of one year, all appointed by Executive Members. Each Founding Executive Member appoints three Directors. The Executive Director will rotate between Executive Members. Supervising the roadmap of the software maintenance that it funds. Making decisions on how the Consortium’s funds shall be expended, accordingly with its objectives (organization of training courses, workshops, etc.). Organizing the various events in relation to the NS-3 Consortium. Receiving and collecting Consortium Members’ feedback and suggestions concerning NS-3 software development. Submit suggestions made by Consortium Members to NS-3 Maintainers. Preparing a yearly scientific, technical and financial report. Additional institutions may be be invited to become Executive Members by the Steering Committee. 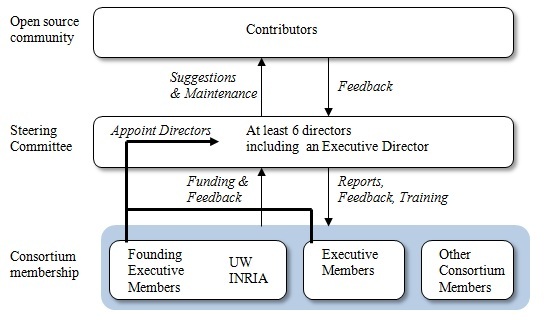 Executive Members who are not Founding Executive Members (UW and INRIA) may appoint one individual to serve on the Steering Committee. Submit suggestions, requests and feedback concerning the ns-3 software development directions and roadmap, to be discussed during the yearly plenary assembly. Attend the Consortium annual meeting during which the ns-3 most recent release shall be presented and during which a sample of suggestions made by Consortium Members shall be discussed. Designate attendees (1 for small companies and universities and 2 for large companies) to attend a yearly, one day ns-3 training course. Receive yearly Consortium financial and technical summary report. Have their name, including logo, placed on the ns-3 website www.nsnam.org. To inquire about participating, please email consortium@nsnam.org.